I’m afraid it’s another cheap and cheerful connection today folks, one that’s facilitated by my TIVO. Naturally, as soon as I returned from traveling abroad last week, I felt impelled to catch up on a small segment of reality TV. The segment in question concerns those ever-compelling Kardashian sisters (those of the K names: Kourtney, Kim, Khloe, Kylie and Kendall), the older three of whom now star in a spin-off from the original family show called Take Miami (aren’t you all so sorry you’re not up on this stuff?). The goings-on are (needless to say) by turns ho-hum and horrifying, the latter aspects stoked in large part by oldest sister Kourtney’s no-good boyfriend Scott (who’s also the father of her baby son Mason). The most recent ep ended with a poignant, simmering shot of Kourtney left literally holding the baby alone after Scott’s latest crazed antics (punching a mirror in some sort of stupor). Well, that made me think (I know!) of our painting today. It’s been ages since I’ve wanted to bring the marvelous Modigliani into the Art 2010 fold, so I’m frankly pleased my (occasional) reality TV fetish has proved fruitful. What an instantly vexing and visceral painting this is: it verily pulses off the wall in the current Chester Dale exhibit at the NGA. Amedeo Modigliani (1884 – 1920) was born in Livorno, Italy, the fourth and youngest child of a well-to-do Jewish family. In the early 1900s he studied art in Florence and Venice before moving to Paris in 1906 and setting up a studio in Montmartre. Modigliani ended up spending the rest of his life there, more or less, no doubt drawn by the fact that from 1904 Paris became the most progressive of artistic centers (think Florence in the Renaissance). 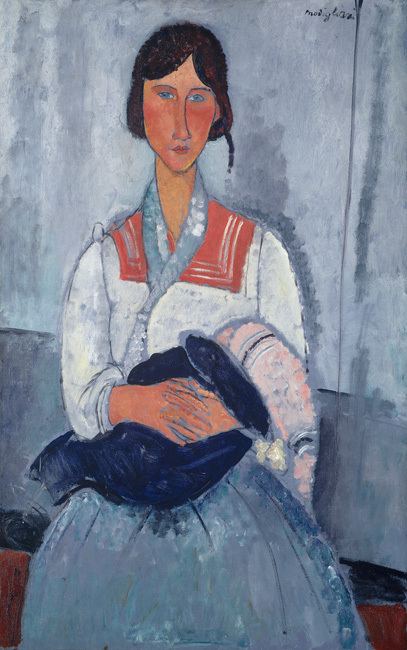 Modigliani settled suavely and quickly into a bustling ambience filled to the gills with painters, sculptors, art dealers and publicists, and buoyed by a market made strong with upwards of 100 private galleries. For me, a work like this Gypsy Woman with Baby looks simple, but that’s a deception: there are deep undercurrents of art historical awareness here, especially of an Italian heritage. See her oval face (which shows mask-like indifference or incisive characterization, depending on your taste), which recalls the long visages of a Botticelli. The elongated forms of her body (the neck most remarkably here) echoes Mannerists of the 16th century. And the sinuous lines that dance down her skirt, over her chest and alongside her face slink in the same way as Sienese painters of the 14th century. So it is, that in his art of assembled, ever-so-subtle influences, we must see Modigliani as the greatest Italian artist of the 20th century, and not a French-formed painter at all. 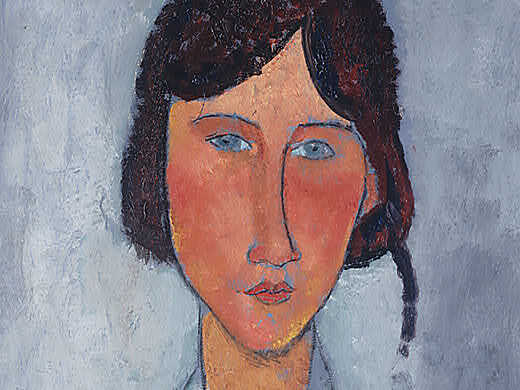 I’ve never been able to shake the sense of sadness I get when gazing at a Modigliani, and this beauty, with her rosy cheeks squared in a quizzical frontal stare (painted but one year before the artist’s death) is no exception. 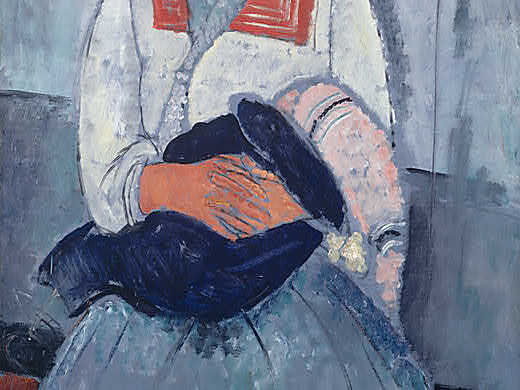 Maybe it’s because in the shades of blue and grey there are echoes of the tragedy that laced the artist’s life: once he’d contracted tuberculosis as a child, the illness persisted throughout his adulthood. 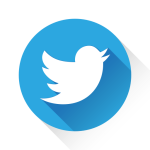 A handsome, amorous and gregarious man, he added fuel to the fire of his ill-health by drinking and drug-taking to excess: he said he’d drink himself dead, and he essentially did. It also happened that Modigliani was known as ‘Modi’ for short, from which by natural corruption the French referred to him as un peintre maudit (cursed). It all adds up to a rather riveting reality, that I for one find hard to divorce from his art. I love how you compared this painting to the Kardashians, I never would have thought of it. 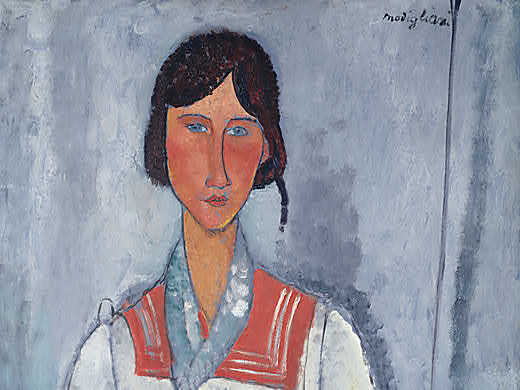 Modigliani has such a distinct style in the way that he paints women, with the long neck, the almond shaped eyes. The way that the woman is sitting and the shape of her shoulders immediately reminded me of one of his other works that I saw in the Modern Art Museum while I was in Paris last month, Femme aux yeux bleus. Mystery solved. The ‘fake Modigliani’ was a PROP painting, painted for the movie “An Affair To Remember” with Cary Grant and Deborah Kerr. If you look closely at the ‘television interview’ scene at 1:04 into the movie the painting appears in the background. Also, seems to still be in the same, or similar, frame. The rich woman that Cary Grant is supposed to be marrying is an art collector so the Modigliani would be a good artist to use. 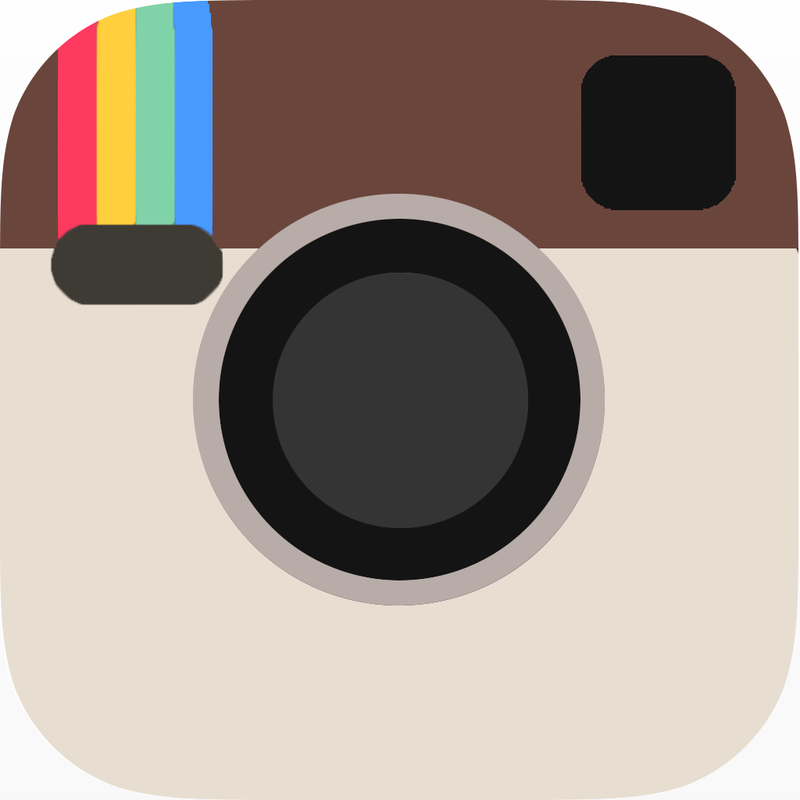 It is the same image. I am sure after filming those props float around and end up with people that believe they have found the ‘real thing’.